Toyota City, Japan, May 18, 2015 — A breakthrough in the real-time observation of fuel cell catalyst degradation could lead to a new generation of more efficient and durable fuel cell stacks. Toyota Motor Corporation and Japan Fine Ceramics Center (JFCC) have developed a new observation technique that allows researchers to monitor the behavior of nanometer-sized particles of platinum during chemical reactions in fuel cells, so that the processes leading to reduced catalytic reactivity can be observed. Platinum is an essential catalyst for the electricity-producing chemical reactions occurring between oxygen and hydrogen in fuel cell stacks. Reduced reactivity is the result of "coarsening" of platinum nanoparticles — a process whereby the nanoparticles increase in size and decrease in surface area. Up until now, however, it has not been possible to observe the processes leading to coarsening, making it difficult to analyze the root causes. The new observation method can enable discovery of the points on the carbon carrier where platinum coarsens, as well as level of voltage output during the coarsening process. The method can also help determine the different characteristics of various types of carrier materials. This all-aspect analysis can provide direction to R&D focused on improving the performance and durability of the platinum catalyst, and of the fuel cell stack. Fuel cells generate electricity through the chemical reaction of onboard hydrogen gas with airborne oxygen. More specifically, each individual cell generates electricity through the chemical reaction between each oxygen cathode and hydrogen anode, with water produced as a byproduct. During the chemical reaction, hydrogen molecules are separated into electrons and hydrogen ions at the hydrogen anode, where the platinum catalyst strips away the electrons from the hydrogen molecule. The electrons travel to the oxygen cathode, generating electricity to power the motor. Meanwhile, the hydrogen ions cross a polymer membrane to reach the oxygen cathode, where water is produced as a byproduct of hydrogen ions and electrons being exposed to airborne oxygen. Platinum also functions as the catalyst for this reaction. Platinum is essential for electricity generation in fuel cells, playing a vital role in increasing fuel cell electricity generation efficiency. However, platinum is scarce and costly. Furthermore, as electricity is generated, platinum nanoparticles coarsen, thereby decreasing fuel cell output. In order to prevent coarsening and maintain catalytic performance, the behavior underlying the coarsening process must be identified. However, the minute scale of the platinum nanoparticles renders observation via conventional means difficult. The conventional method of platinum nanoparticle observation is a fixed-point comparison of pre-reaction platinum particles with post-reaction particles. Through this method, it was discovered that post-reaction platinum nanoparticles are coarser with reduced reactivity. But, the causes of this reduction can only be hypothesized due to the inability to observe the behavioral processes leading up to the coarsening. In contrast, the new observation technique involves a new scaled-down observable sample that can simulate the exact environment and conditions occurring in fuel cells. This, in addition to a newly developed method of applying voltage to samples mounted inside a transmission electron microscope, allows the coarsening process to be observed in real-time at all stages as electricity is generated. A transmission electron microscope is a microscope capable of observation and analysis of atomic-sized (0.1 nm) materials. The dotted lines show the coarsening of platinum nanoparticles on top of a carbon carrier. 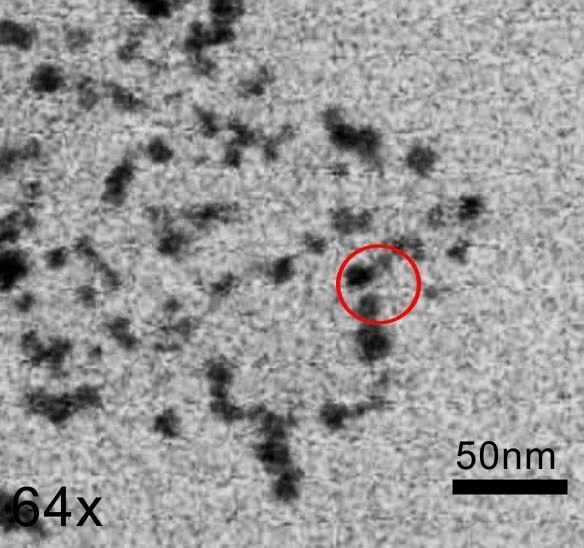 The platinum particles have moved and joined together forming larger, coarser platinum nanoparticles.